They’re back and wearing their dancing shoes. SundanceTV has announced the third season premiere of its Hap and Leonard TV show. Hap and Leonard: The Two-Bear Mambo, will debut on Wednesday, March 7, 2018 at 10:00pm ET/PT. Watch a teaser, below. The darkly comedic crime drama is a TV adaptation of the Joe R. Lansdale novels. The Hap and Leonard TV series stars James Purefoy and Michael Kenneth Williams as best friends Hap Collins and Leonard Pine. Season three comes from the third novel in Lansdale’s series. The SundanceTV show also stars Tiffany Mack as Florida Grange and Cranston Johnson as Detective Hanson. Watch the Hap and Leonard season three teaser and learn more about the newest installment from the SundanceTV press release. According to star James Purefoy, production on the third season ended just ahead of Thanksgiving. Check it out. Another blazing season of #hapandleonard in the can. Goodbye Atlanta. Thank you for having us. I love it here. Here’s the press release with more details. IT TAKES TWO TO MAMBO! NEW YORK – December 11, 2017 – SundanceTV announced today that the third installment of the network’s critically-acclaimed original scripted anthology series, “Hap and Leonard: The Two-Bear Mambo,” will return Wednesday, March 7, 2018 at 10p/9c. The six-part drama, takes inspiration from the third installment of the popular book series, The Two-Bear Mambo, by famed author Joe R. Lansdale. Principal cast James Purefoy (“The Following,” “Rome”) and Michael Kenneth Williams (“The Night Of,” “The Wire,” 12 Years a Slave) will return as title characters Hap and Leonard, and will be joined by a brilliant ensemble cast including Oscar® award-winner and multiple Golden Globe® and Emmy® award-winning actor, Louis Gossett Jr. (An Officer and a Gentleman, Roots), Emmy® and Golden Globe® award nominee Corbin Bernsen (“L.A. Law,” “Psych”), Andrew Dice Clay (Blue Jasmine, “Entourage”), Laura Allen (“American Horror Story: Cult,” Mona Lisa Smile) and musician Curtis Harding. Set once again in East Texas just before Christmas of 1989, Hap and Leonard scramble to locate Florida Grange, who has gone missing in the Klan-infested town of Grovetown. Once again at the center of an impending storm of Biblical proportion, Hap and Leonard find themselves at odds with a cast of characters so tough they could chew the bumper off a pickup truck, including a possibly corrupt sheriff, and the leader of the Caucasian Knights. The boys learn that the good guys don’t always win, and nobody beats Mother Nature. The anthology series follows two lifelong best friends, Hap Collins (Purefoy), an East Texas white boy with a weakness for Southern women, and Leonard Pine (Williams), a gay, black Vietnam vet with a hot temper. Tiffany Mack (Wicked Love, “Timeless”, “iZombie”) who stars as Florida Grange, Leonard’s lawyer and the object of Hap’s deep admiration, and Cranston Johnson (“Atlanta,” Find a Way) who plays Detective Hanson, return as series regulars. “Hap and Leonard” is a wholly-owned original series produced by AMC Studios. John Wirth (“Hell on Wheels,” “Terminator: The Sarah Connor Chronicles”) returns as showrunner and executive producer for season three, and Jim Mickle, Nick Damici, Jeremy Platt and Linda Moran return as executive producers. Episodes will be directed by Jim Mickle, Abe Sylvia and Michael Katleman. Joining the writing team this season is Pam Veasey, along with previous writers Nick Damici, Ione Lloyd, Jim Mickle and John Wirth. What do you think? Have you watched the first two season of the Hap and Leonard TV show? Do you plan to check out season three on SundanceTV? 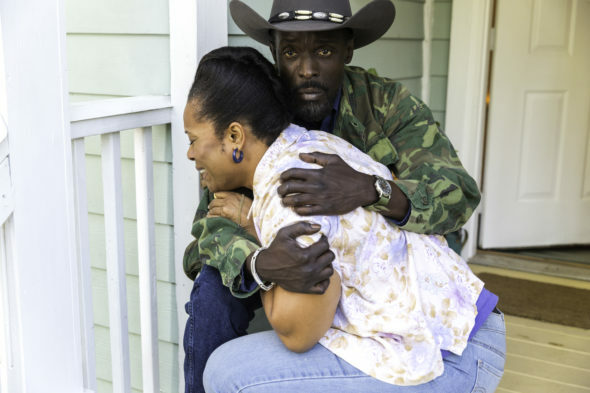 More about: Hap and Leonard, Hap and Leonard: canceled or renewed?, SundanceTV TV shows: canceled or renewed? Hap and Leonard: Cancelled or Renewed for Season Four on SundanceTV? Hap and Leonard: Season Two Renewal Coming from SundanceTV?